WinSCP Free For Windows Download. WinSCP is an FTP client program supports SSH, which easily allows you to transfer files to a remote server. 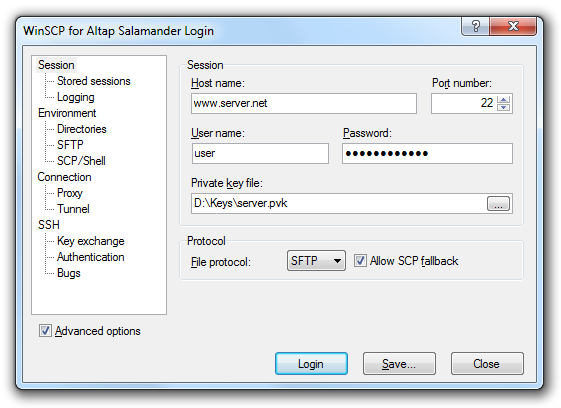 WinSCP can connect to an SSH (Secure Shell) protocol server using SFTP (SSH File Transfer Protocol) and SCP (Secure Copy Protocol) service. WinSCP can be integrated with Putty. It features intuitive graphical interface (like Windows Explorer) and supports "drag & drop" to move files from one window to another (a window representing local PC files and other files on the server). The features are similar to those of other charged FTP clients such as CuteFTP, while boasting a larger number regarding a free software such as Filezilla. Easily send files to the server and download files from the server to the PC. It also allows you to perform various actions on folders and files hosted on a remote server, for example, create directories, rename files and directories, modify the properties of reading and writing (equivalent to chmod command), create symbolic links, and some actions rather than could be done from the command line, but require some basic knowledge of Linux. WinSCP Free For Windows has a built-in text editor, which can be very useful when you need to make small changes that require some urgency, on a file, avoiding having to open an external editor for that. Another useful tool present in the FTP client is the synchronization of folders or directories. If changes are made in multiple files, and you want to avoid gaining one by one, after finishing with all updates applied this tool, which is responsible for comparing local server with folders and uploading only the changed files . For more information are available a complete tutorial that is available on the official website of this exciting project. WinSCP 5.7.0 is the latest, updated in February 2015, this application can be downloaded free version. It works only for Windows and is available in Spanish, both executable and portable edition.